Last week marked a big milestone for Edgar and me; one I've dreamed of since I was six and 'self-published' my first book. On Monday we received a copy of 'Wish You Were Here,' the first book we've had the opportunity to illustrate in its entirety. 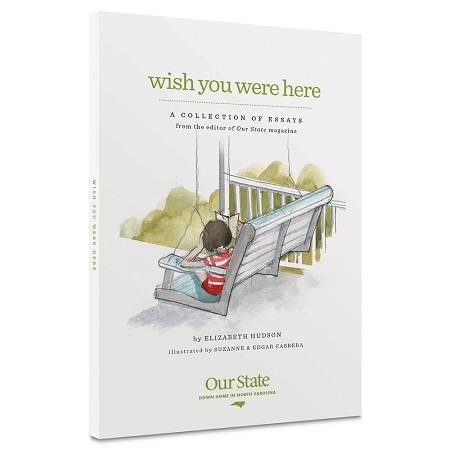 This collection of essays by Elizabeth Hudson, Editor of Our State Magazine, centers around the experiences growing up and living in a small North Carolina town. We are so proud to have collaborated on this book with Elizabeth and Editorial Designer Jason Chenier, who paired the images and writing beautifully! Of course, we'd be beyond flattered if you'd like to purchase the book through the Our State Store, but we also invite you to take a look at a small sampling of the 45 original illustrations we worked on here. And if, by chance, you find your way here via the book, please let us know! We'd really love to hear your thoughts. that is so great! congrats!! Of course I was so excited to see you had illustrated a book and ordered mine the same day you announced it! I received mine this week and it's just lovely. I have yet to carve out time to read anything - but have looked at the illustrations and adore your work so much.... You are one of my favorite illustrators yet. I follow you faithfully and love seeing your creativity. It speaks to my soul.... Thank you for that! Congratulations!! The illustrations are lovely - my favorite is the peaches, I think. I'm still getting my legs with watercolor, so to see how you achieve shadows and blending so beautifully, while keeping it completely true to the sketchy style that is yours...? Love. It. Thank you ALL for your kind words and support! They mean a lot!